Before we left Disneyland to drive to Las Vegas, we had breakfast at Steakhouse 55 at the Disneyland Hotel. 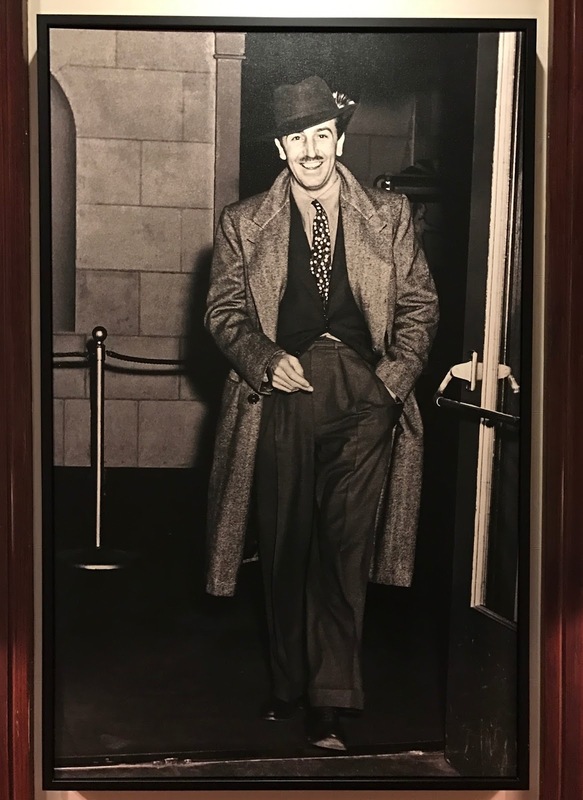 The theming of the restaurant is Old Hollywood, and I loved the picture of Walt Disney at the entrance. 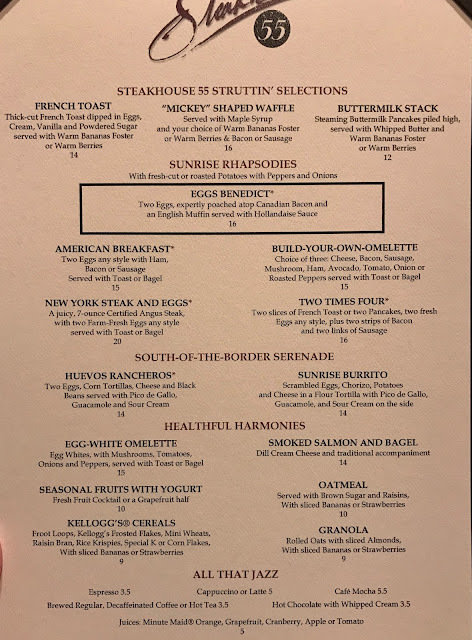 Steakhouse 55 did not have an allergy-friendly breakfast menu, but a chef came out to speak to me about gluten free options. Beyond egg dishes, I remember him mentioning that I could order gluten free waffles or pancakes, the Huevos Rancheros, and the New York steak and eggs. My daughter Emma ordered the Huevos Rancheros with two eggs, corn tortillas, cheese, black beans, and Pico de Gallo. It looked really good, but I did not taste it, because we did not have it marked as an allergy order. 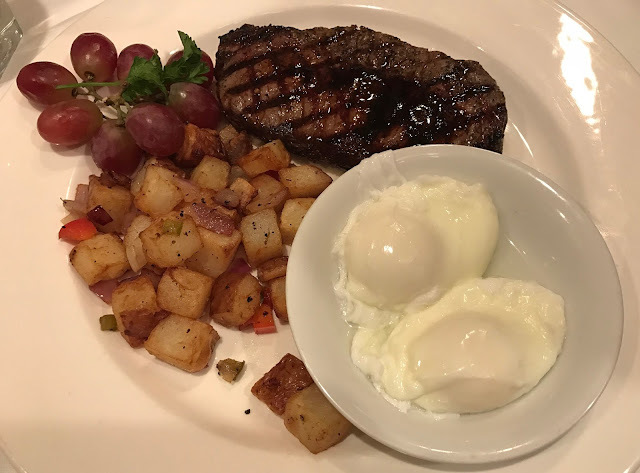 My husband and daughter Kate shared the New York steak and eggs, which they said was very good. I ordered a gluten free Mickey waffle with bananas foster and sausage. I was hesitant, because the chef told me that they use a Bob's Red Mill mix, which is not my favorite, but he mentioned that he adds honey, so I decided to give it a try. 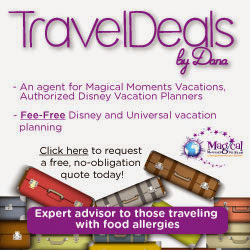 I was so glad I did, because to my shock, I received a large gluten free Mickey waffle, the first one I have ever had. Usually when I order Mickey waffles at Disney World and Disneyland, I receive 3 smaller waffles. The waffle itself was very good, especially around the edges, which were nice and crispy. The bananas foster was a great topping for my waffle, and I loved my sausage dipped in the syrup they brought me. 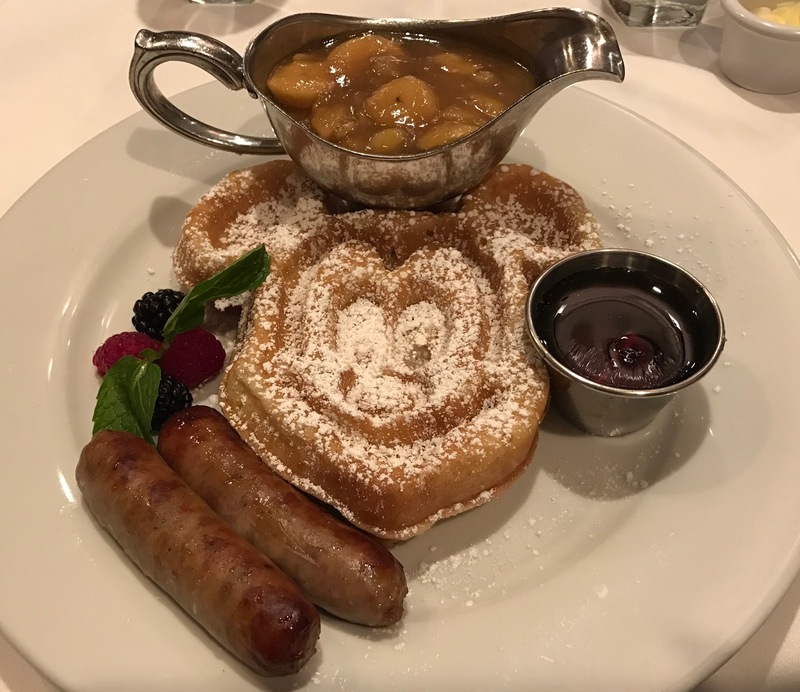 Overall, we all enjoyed our breakfasts at Steakhouse 55, and would dine there again the next time we go to Disneyland. You can read more about Steakhouse 55, view their menus, and make advance dining reservations on Disneyland's website here. 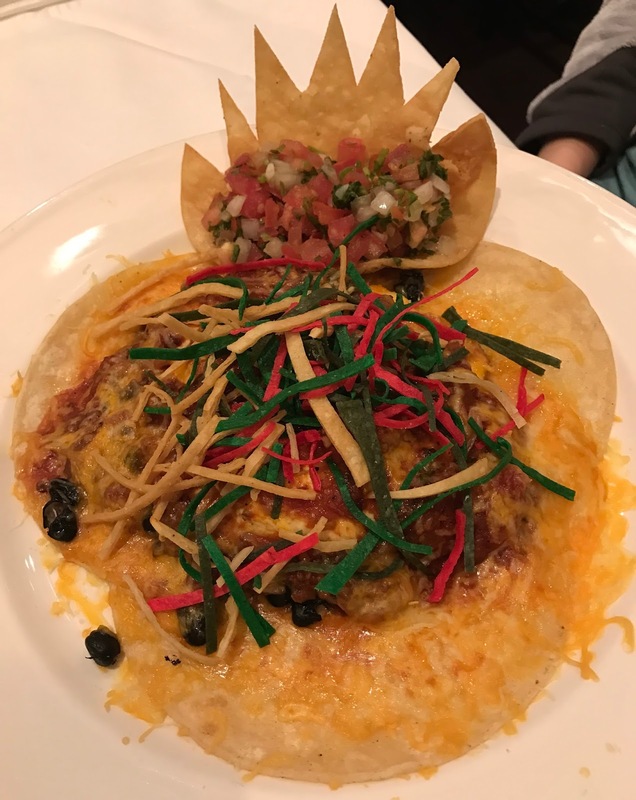 What are your favorite gluten free options at Steakhouse 55?